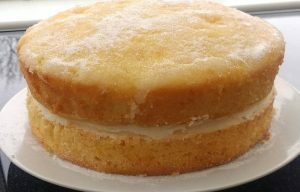 Lemon Drizzle cake is traditionally based on a rich Victoria mixture – equal weight of butter, sugar, eggs and flour. I find them a bit heavy, and get through the eggs too quickly, so I explored a version based on the proportions of my Chocolate Cake – and it works! I normally bake in a small top oven, but all ovens vary so you may need to adjust time or temperature. This makes 26-28 oz (weight) of cake batter. Dairy free! Sieve flour, baking powder, and sugar together. Add the margarine and cut it into the flour a bit, with a fork. Stir in the grated lemon rind. Pour the lemon+water and eggs into the bowl with the other ingredients, and beat until smooth. Divide between two lined 1 lb loaf tins and bake at 170°C for 40 min (13 oz batter per cake = 12 oz cake when baked). COOL IN TINS, it’s a bit fragile when warm. For the Drizzle: While it’s baking, weigh the rest of the juice, then warm it gently (don’t boil) and then stir in the same weight of caster sugar and stir until dissolved. While the cake is still warm, spoon or pour over the syrup onto the cakes. If they are still sticky when cold, dust with caster sugar. Slab cake: Spread evenly in a greased 7″ x 9″ x 2″ baking tin, and bake just above the bottom shelf, at Mk 4/350°F/180°C, for about 30 minutes, or until just done. Remove from oven, place tin on a wire rack, and cover with a clean tea towel. Cool in the tin, and store in tin. Layer cake: Divide evenly between two 7″ diam layer tins (line the bottoms), and bake at 170°C for 25-30 min. Sandwich with lemon curd and light buttercream (American style frosting) made with lemon. Cupcakes: 1 doz normal size take about 20 min, 4 doz mini cupcakes about 15 min. Keeps well, about 1 week if in a plastic container or tin. If stale, warm 1 piece in the micro for 10 sec, serve with cream or ice cream.